Teach, practice, review and assess basic two-beat rhythm patterns using Gunild Keetman's building bricks: ta ta (2 quarters, ti-ti ta (eighth-note pair and quarter), ta ti-ti (quarter and eighth-note pair), ti-ti ti-ti (two eighth-note pairs), and ta-ah (half note). This PowerPoint Slide Show is loaded with eye-catching color and some cute animation when matches are made. 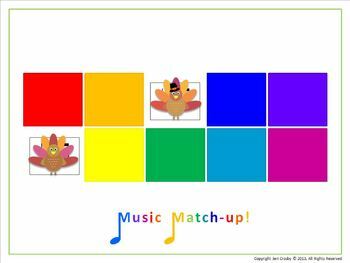 This colorful, interactive game uses the memory game or concentration format. 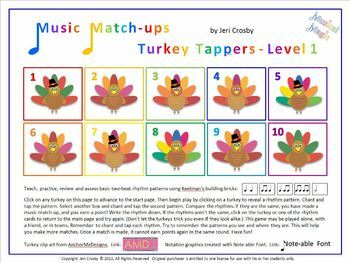 It can be used as a classroom game or a music center activity. 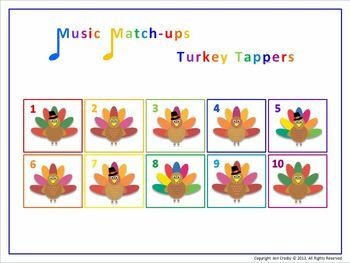 Students will engage in chanting, tapping/clapping, reading, comparing and contrasting two-beat rhythm combinations. 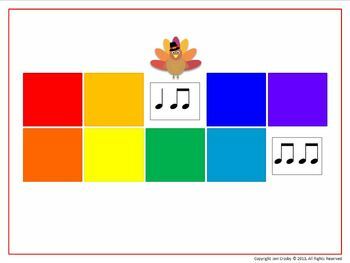 Instructions (included on first slide): Click on any turkey to reveal a rhythm pattern. Chant and tap the pattern. Select another box and chant and tap the second pattern. Compare the rhythms. If they are the same, you have made a music match-up, and you earn a point! Write the rhythm down. If the rhythms aren't the same, click on one of the note cards to return to the main page and try again. This game may be played alone, with a friend, or in teams. Remember to chant and tap each rhythm. Try to remember the patterns you see and where they are. This will help you make more matches. Once a match is made, it cannot earn points again in the same round. Have fun!